Cree has joined the connected lightbulb battleground, and its first entry looks like a winner, even if at introduction the choice of control hubs is limited. The Cree Connected LED bulb is modeled on the company's 4Flow design, not its earlier filament tower one. Into the space freed up by the lack of a heat sink in the bulb's base, Cree has inserted a ZigBee radio. Cree is not selling a ZigBee controller. This is probably a good move, because the marketplace is awash with them. At introduction, Cree's bulb only talks to the Wink controller. The company says that compatibility with other controllers will be introduced soon. The best feature of CNet's review is the table in which Crist compares the Cree Connected LED with four direct competitors: GE's Link LED, the Philips Hue Lux, Connected by TCP, and the Belkin WeMo LED. (Search for "smart LEDs" in the article to jump to this comparison table.) Cree's bulb is the lightest in weight of its competitor class, at 1.9 oz. ; it is tied with GE's for lowest price, at $15; and it's the brightest of the lot (872 lm), though not the most efficient (76 lm/W). Cree's CRI is only 80 while both GE and Belkin offer bulbs in the 90-CRI range. The bulb is supposed to be available from Home Depot's website now and will appear in HD stores at some unspecified later time. I was not able to find any trace of the bulb on homedepot.com, however. The bulb's appeal will be limited at first, until it is compatible with a wider variety of ZigBee hubs -- CNet mentions Staples Connect and SmartThings as a good starting point. 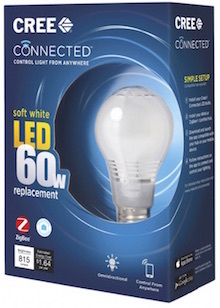 Once this issue is addressed, the Cree Connected LED bulb looks like a sure winner for the connected home.